Some albums poke you in the eye from the outset; you know what you are getting, and others reveal their beauties only with time and attention. I am Very Far, released through Jagjaguwar Records, does that irritating thing of doing both simultaneously – appealing from the first play, perhaps not initially all that special, but with the repeated plays I have given it now, the latest Okkervil River offering gets better each time and is a nervous early suggestion for one of the albums of the year. 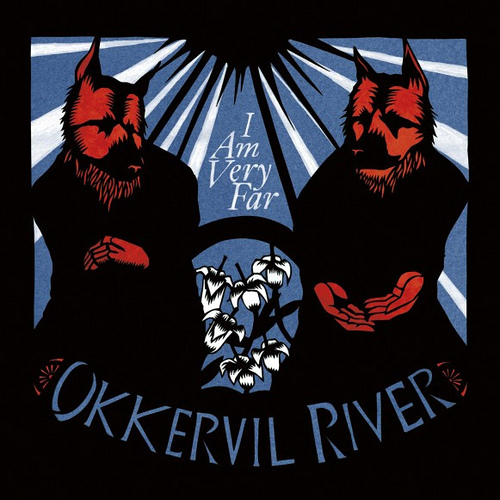 So far Okkervil River have been a bit on the edge of my attentions, although the recent work with the legendary Rocky Erickson on his come back, True Love Cast Out Evil, brought both Erickson and Okkervil River back into sharper focus for me. I have to admit though that the spin out band from early Okkervil days by Jonathon Meiberg, Shearwater, have long claimed a place in my heart. Anyways, back to I am Very Far. There is a consistent feeling that here is a band reaching out for the wider acclaim that might have so far eluded them, perhaps an outstretched arm toward the stadium circuit? There is drive and underlying power to many of the songs, but fortunately, in my view, they haven’t added that grim gloss and polish that so often accompanies such efforts. There is a large band engaged here, double drums and basses and all that jazz which of course lend a depth and scale to the sound, but Will Sheff has allowed it all to sound just the merest bit rough and ready. The impetus that such a band provides means that at times there is a wonderful sense of a band on the edge of losing its grip on the songs – the later stages of Rider being a good example. The album starts well, but as each track goes by, it gets stronger and stronger, winding itself up, growing in confidence and purpose. Show Yourself contains the finest of hooks, both vocal and instrumental, but is wrapped around with delicious bits and pieces disturbing the order of what might have been a straightforward good song. Instead it builds to something glorious, ragged and beautiful. The last three tracks, Your Past Life as a Blast, Wake and be Fine and the concluding Rise, bring this fine album to spiralling end. Rise itself, a near perfect six minutes or so, building to a climax that could so easily have been tidy and organised but instead collapses under its own weight, layers of sound falling away in place of the bombast ending that might have been. I have no idea whether or not Okkervil River will find in this album the cross over to wider love and success, less still if that’s what they would wish, but what they have here is an album of remarkable music build out of a maturity, skill and vision. This entry was posted in Uncategorized and tagged Jagjaguwar, Jonathon Meiberg, Okkervil River, Shearwater, Will Sheff. Bookmark the permalink.